Will 'track queen' Hima Das be able to do a Tampere in Doha? Assam’s sprint queen Hima Das to be appointed UNICEF India’s youth ambassador at a special event on Wednesday. In her role as a Youth Ambassador, Hima would work towards raising awareness about the rights and needs of children, and help amplify the voices of children and young people as active participants in decision making, thus contributing to their holistic development. UNICEF India works with Central government to ensure that each child born in this country gets the best start in life, thrives and develops to become a successful person. After her medal wins in the Asian games Hima has been on under the spotlight since. She received the Arjuna Award from President Ram Nath Kovind this year. She is the fifth Arjuna Award winner player from Assam. 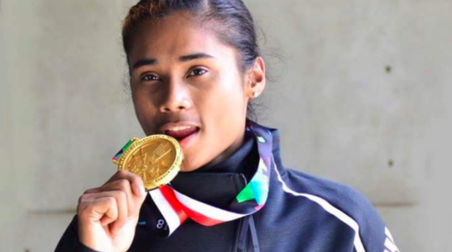 The 19-year-old girl from Dhing in Assam’s Nagaon district won one gold and two silver medals at the recently held Asian Games in Indonesia’s Jakarta. Junior World Champion and Asian Games medalistHimatrained in the lush green rice fields of Dhing and then touched dizzying heights of success at Tampere in Finland when she became the only Indian athlete to have won gold at an international event – at the IAAF World Under-20 Athletics Championships.